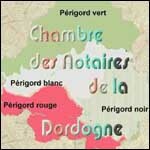 A USEFUL site for Dordogne property hunters is that of the region’s notaires. On it you fill find a search facility that allows you to pick an area of the department and search for everything from an apartment to a farm. You can choose any of the four Périgord regions or the town of Périgueux itself, and then narrow your search to a particular canton. Unfortunately the search is not the most intuitive so you do have to spend some time going through the different choices, but the results are delivered quickly. Many of the properties will have a photograph and a description, sometimes in English, as well as contact details. You will also find the addresses, including email address, of the notaries for the principal towns in the region as well as the main office in Périgueux. If you are keen to move to the Dordogne the site is one to add to your favourites. To take a look at the site, please click here.